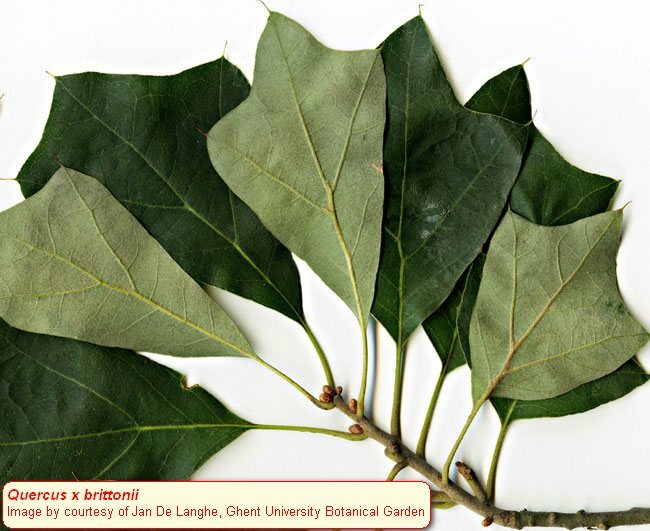 Quercus x brittonii.Courtesy of Jan De Langhe, Gent University Botanical Garden.oaks.of.the.world.free.fr. (Accessed 9/2014). Quercus x brittonii is a shrub or small tree. Leaves alternate, egg-shaped, leathery; base wedge-shaped; 1-3 lobes each side; dark green above, hairs on veins; grey-green, yellowish hairy below; good fall color (Hélardot 2015). Flowers: Monoecious, males in catkins. Females solitary or few together. Frequency in NYC: Rare, but not listed by New York State. Habitat: Found in open, dry sandy soil but apparently hardy in other habitats.